Recently I have been testing some software for Presenting, Learning / Web Conferencing, and data sharing, but frankly none of them displayed good results. There are a few paid solutions, but my Open Source nature led me to test the Apache Open Meeting app. OpenMeetings is a software used for presenting, online training, web conferencing, collaborative whiteboard drawing, document editing, and user desktop sharing. The product is based on the OpenLaszlo RIA framework and Red5 media server, which in turn are based on some open source components. Communication takes place in virtual "meeting rooms" which may be set to different communication, security, and video quality modes. The recommended database engine for backend support is MySQL. The product can be set up as an installed server product, or used as a hosted service. Work on OpenMeetings began in 2006, and it has been downloaded over 250,000 times. OpenMeetings is available in 31 languages. Working on all major operating systems, but today I will write the tutorial based on the latest 3.1.4 version on CentOS version 6 and 7 Linux (dedicated server / compatible with Xen/KVM if virtual). 4) Installation of Oracle Java 1.8. Java 1.8 is necessary for OpenMeetings 3.1.4. Java 1.7 can be used only for the previous OM versions. We shall install Java 1.8 now. wget --no-cookies --no-check-certificate --header "Cookie:gpw_e24=http%3A%2F%2Fwww.oracle.com%2F;oraclelicense=accept-securebackup-cookie" "http://download.oracle.com/otn-pub/java/jdk/8u101-b13/jdk-8u101-linux-x64.rpm"
And everything should work as expected, but it is recommended that you choose the latest 1.8 version. swf (flash file), which can later be presented on the whiteboard. Also convert jpg2swf, png2swf, gif2swf, and etc. Don´t compile the newer version, since they don't have pdf2swf, which is necessary. 9) Jodconverter participates in the process to convert uploaded files. The Java OpenDocument Converter, converts documents between different office formats. It leverages OpenOffice.org, which arguably provides the best import/export filters for OpenDocument and Microsoft Office formats available today. Word to OpenDocument Text (odt); OpenDocument Text (odt) to Word and etc. For, now we will leave it, and remember the path where was extracted. 10) Next, we will need to install FFmpeg. FFmpeg is a free software project that produces libraries and programs for handling multimedia data. FFmpeg works with video. We will now install the necessary packages, libraries and vlc player which is needed to play the meeting recordings. When finished, please, go to step 11). 11) Installation MariaDB data server. MariaDB is a community-developed fork of the MySQL relational database management system intended to remain free under the GNU GPL. It is notable for being led by the original developers of MySQL, who forked it due to concerns over its acquisition by Oracle. You may use the default Oracle version or Percona, but that is up to you. Now we need to set password for Root. Please, modify new-password by your own. Note: You may edit /root/.my.cnf and configure password less access for MySQL, or use -u root -p command. Now we create a user with all permission on this open314 database. , Url=jdbc:mysql://localhost:3306/openmeetings31? ...to , Url=jdbc:mysql://localhost:3306/open314? That is name of the database that we did initially (previously). The database user that we did initially for the database. It is the password that we did initially for the user "nemanja" in the database. So if initially you choose another name and password for the database, you will need to adjust them here. 13) Script to launch red5-OpenMeetings. Click on > and proceed to the next menu. 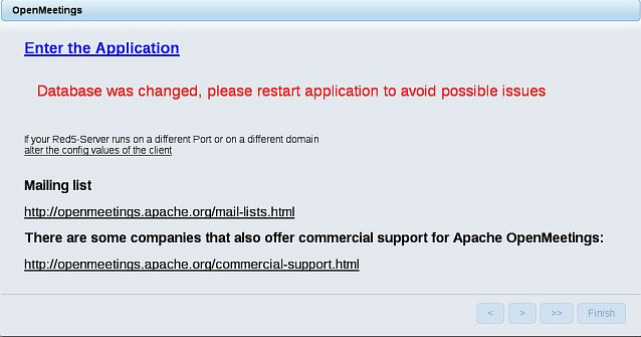 Username = a-name ...this user will be administrator. Userpass = a-password ...for the previous user. Email = email-adress ...of the previous user. User Time Zone = country where is this server Name = example-openmeetings ...group name to choose. When the installation is finished, we can configure the rest of settings. Click the Finish button, and wait a few seconds until the tables populate. 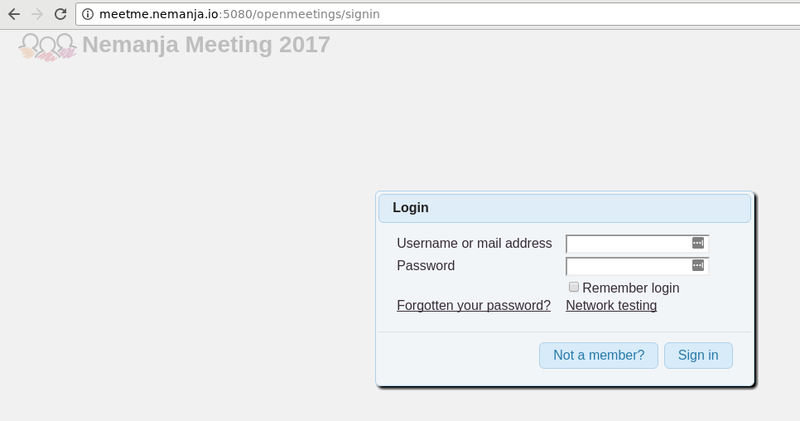 You can enter the username and password which you have defined previously and enter your Apache Open Meeting Dashboard for the first time! Congrats. NOTE: Remember to save after each change (arrow number 3, in the up screenshot). 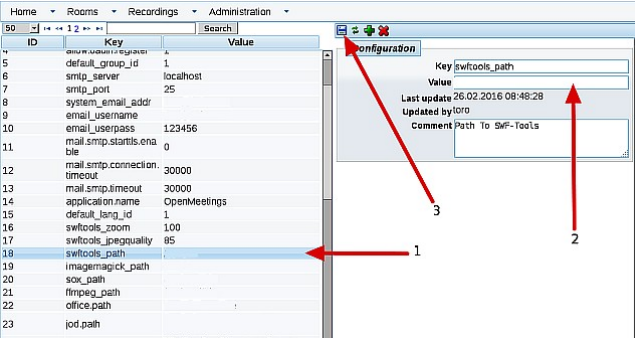 In case the jod.path field does not exist, (which I have a seen few times), you will need to add new and configure the path as described previously. Your new virtual office is now configured and you can start configuring Rooms, Users and send invites. I have intentionally skipped SMTP configuration, because I believe that you already know how to configure an external SMTP user if needed (by default it is PHP Mailer). Soon I am planning to make an Ansible and Bash script installer for this amazing application, but until then feel free to follow my instructions. I would appreciate reviews, if possible.